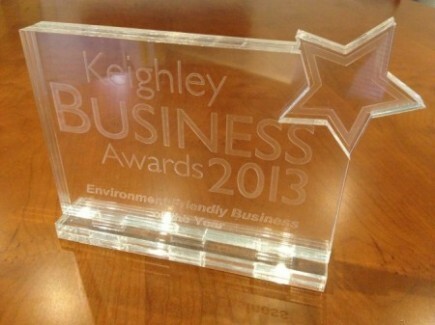 Airedale springs were recognised for their outstanding commitment to the environment during the recent Keighley Business Awards dinner. The Keighley Business Awards was launched in 2013 to recognise the hard work, determination and achievements of the area’s finest firms and is hoped to become an annual event. The judges of the Environment Friendly Business of the Year award were looking for a company able to demonstrate a strong commitment to putting environmental issues as the centre of their business and rated Airedale Springs ‘top of the list’. Airedale Springs Chairman, Tim Parkinson said the award was recognition for the dedication and hard work put in by all the employees and was delighted to accept the award on their behalf. Every three years we are assessed by Lloyds Register on our entire quality management system with an auditor on site for 2 days looking into every aspect of our operation prior to renewal of our ISO9001 certification. We are delighted that our assessor highly recommended our continued approval and praised the work carried out to ensure our customers get the best possible service. Only a short walk from the centre of the historic village of Haworth, the grounds surrounding our new premises are an ideal visitor parking site for this ever popular event. Around 7000 people parked their vehicles with us over the 2 day period, raising an amazing £3,400 in parking fees. Half of the monies raised will be donated to the National Armed Forces Charity SAAFA, with the other half going to the organisers of the Oxenhope Straw Race – a popular local event that raises money for Manorlands hospice and many other local charities. 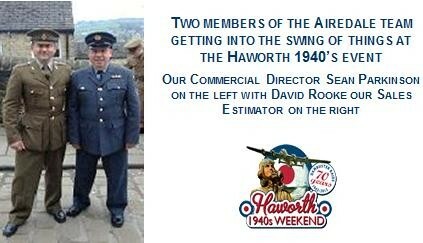 We would be delighted to welcome you to our premises here in Haworth. If you would like to arrange a visit please contact our Commercial Director, Sean Parkinson.